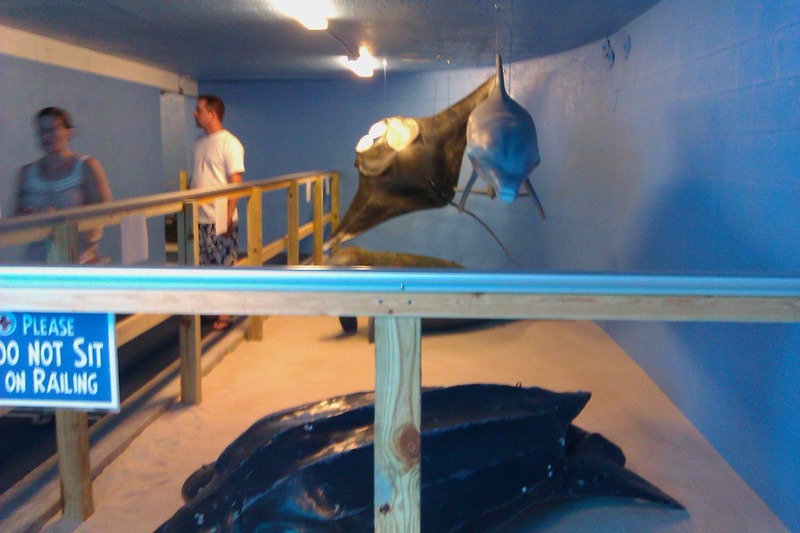 The only manta ray we have here at CMA is just a large ornament-like statue that was used in the movie "Dolphin Tale"
One day when I was doing a mobile prop shift at the Dolphin Deck, an elderly man asked me if we had manta rays on display. 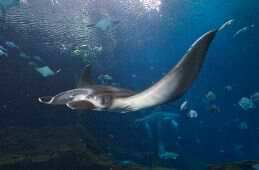 I told that we did not have any manta rays in our care because currently we just do not have any room for them here at Clearwater Marine Aquarium to put them in so that they would be cared for. I told him that currently the only animals that are on display at the aquarium are dolphins, otters, sea turtles and certain fish species that are all native to Florida waters. While he was a little disappointed by my answer, he was glad to have his question answered. As a lot of you may know, Georgia Aquarium in Atlanta, Georgia is currently the only aquarium in the western hemisphere to ever successfully display a colony of live manta rays in human care (I do know of one aquarium in Japan that has already become the first facility in the entire world to successfully breed these amazing animals in captivity). So the question is that why is Georgia Aquarium the only western aquarium to house manta rays and whale sharks and not other aquarium favorites like SeaWorld or Clearwater Marine Aquarium? This is because both animals are difficult to maintain in human care when it comes to water temperature, dietary needs, and exhibitional space when it comes to thriving in aquariums since both animals are pretty large by nature. So to see how and Why Georgia Aquarium is currently the only western facility to house two dream animals (manta rays and whale sharks), let’s take a look at Georgia Aquarium’s Ocean. On the money issue, the Ocean Voyager Exhibit costed Georgia Aquarium about $20 million to build from top to bottom. 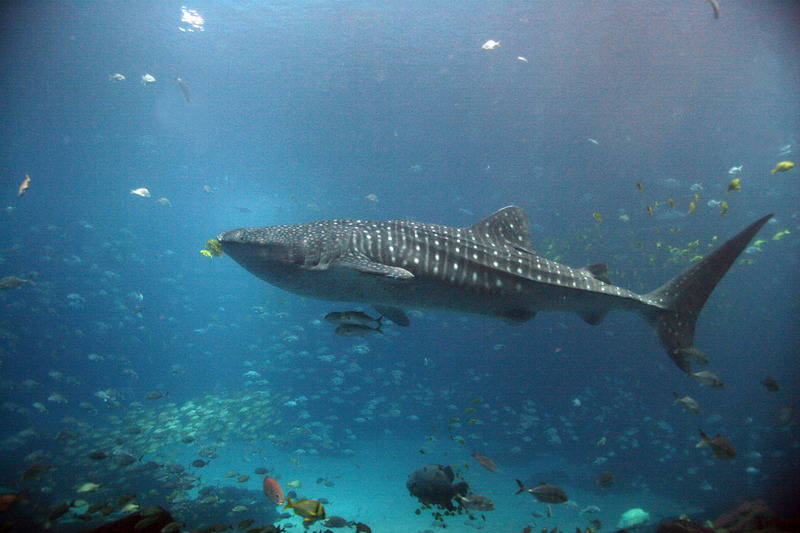 According to Georgia Aquarium’s site the exhibit contains about more than 6.3 million gallons of salt water and an estimated 4,574 square feet of exhibition space. Oh, the water temperature is also anywhere from 74-76 degrees, the perfect water temperature that these tropical animal usually prefer out in the wild. One of the reasons why most aquariums prefer to keep water temperature warm than what most aquarium goers think is because they keep it at the perfect water temperature that the animals prefer. Like for example, the water temperature at SeaWorld’s Shamu Stadium is about 55 degrees and this is because killer whales can usually be found in cold temperate or polar waters throughout the world. Another important thing when it comes to maintaining manta rays and whale sharks in human care in Atlanta is the dietary needs. While the whale sharks are given a combination of both small fish and lettuce, the rays are given a variety of fish that they would feed on out in the wild. So in conclusion, it’s safe to say that Georgia Aquarium is currently the only facility in the western hemisphere to successfully maintain both whale sharks and manta rays in human care although, both animal species have been known to be extremely difficult to keep in captivity because of their large volume of needs. The saddest concept I get from most aquarium goers (most of whom live overseas) who come to Clearwater Marine Aquarium is the fact that when they come to visit us, they usually expect to see a bigger and louder aquarium with a large animal collection that may breed it’s animals for research, and conservation purposes. 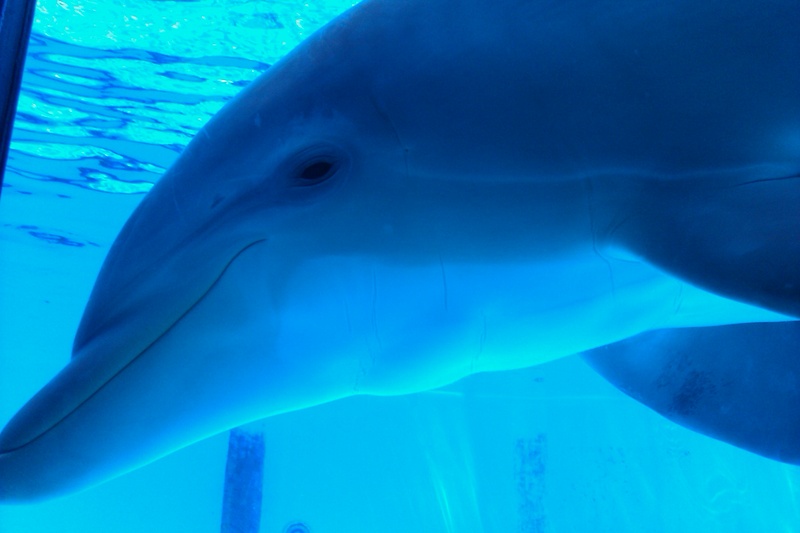 But, as a small facility, Clearwater Marine Aquarium is a working animal hospital that is dedicated to rescuing, rehabilitating, and releasing animals in need that only displays rescued and orphaned animals that could not be released for various reasons depending on individual cases. It currently does not have a permit that would allow the facility to breed these animals for research and conservation purposes. However, the facility is expanding. 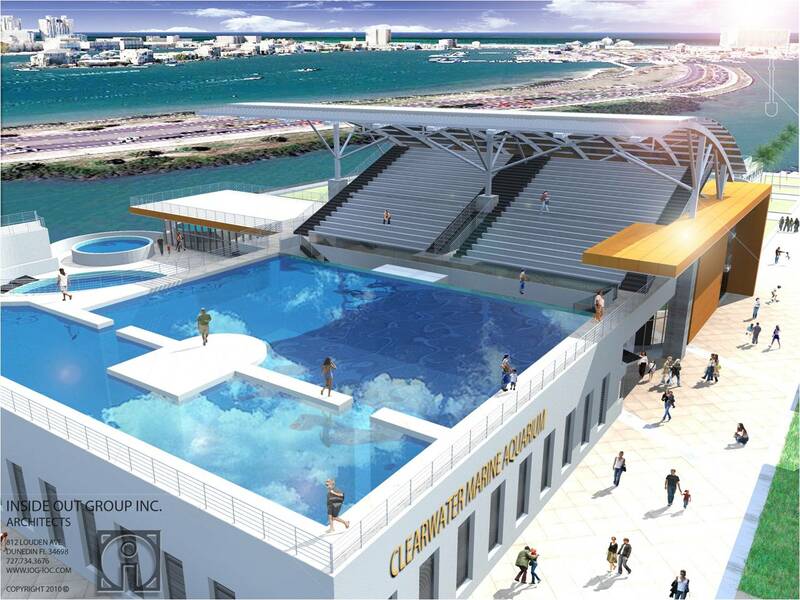 Not to long ago, my fellow staff mates, including the CEO broke ground on a $12 million expansion on our beloved aquarium which will include a new dolphin exhibit that would be the size of SeaWorld’s dolphin stadium, and a new sea turtle hospital. 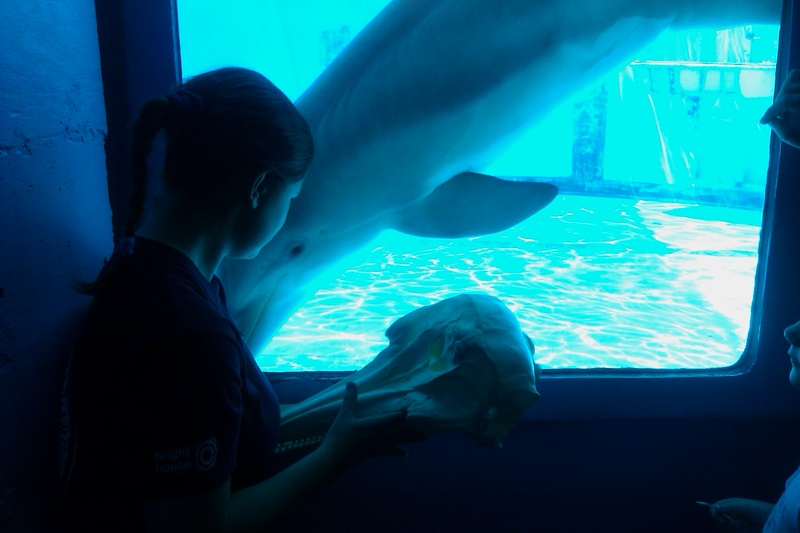 So, everyday we, the staff, volunteers, and interns here at Clearwater Marine Aquarium are dreaming big everyday to see our animals continue to inspire the world to make a great connection with our oceans. Oh, by the way, you can also leave your mark here by donating to our Pave the Path campaign by donating $100 or more to leave your legacy on our expansion. So perhaps one day, CMA may become just a large facility with a big time conservation message for all the world to cherish. Just not too long ago, a new study done by the International Program On The State Of The Ocean (IPSO) has revealed that marine animals such as sea turtles, manatees, sharks, penguins, whales, and the marine ecosystems they all depend on are all at risk of becoming victims of an unprecedented marine mass extinction that could happen in our lifetime. But, unlike other mass extinctions of the past, this one would be the result of generations of human activity. 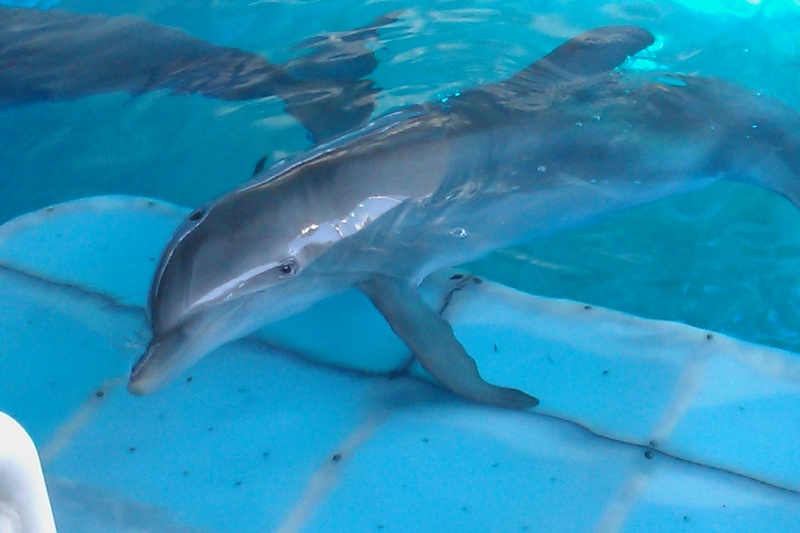 Winter, a five-year-old Atlantic bottlenose dolphin lost her tail in a crab trap, an example of what marine derbis can do to animals like dolphins. Just to make matters worst, in some places in the world, there is a huge increase in “dead zones”, which are oceanic areas where fish and other animals cannot survive because of lack of oxygen is making impossible for marine plants and coral reefs to thrive, all of which the animals need to survive. There has already been a report of large dead zones in Gulf Coast which may have been a result of the 2010 Deepwater Horizon Oil Spill. It seems like everything is starting to die out on us during our lifetime. This is not good because then, if everything in the ocean dies out, then, the next generation may never be able to enjoy seeing sea turtles swim in coral reefs, nor killer whales catching themselves a salmon in the Pacific Northwest. volunteer or intern at your local stranding or wildlife rehabilitation center. These places rely so much on the dedicated work of both interns and volunteers alike. Share your environmental concerns on the internet, your community, your friends, and even your family. Educate yourself on marine wildlife, marine biology and conservation by getting a book at a store, library, or even look the topics up on the internet. Adopt an animal through any conservation organization that offers symbolic animal adoptions like Save the Manatee Club, The Whale Museum, Clearwater Marine Aquarium, and The BC Killer Whale Adoption Program. Conserve water, paper, and energy. Don’t buy any wildlife-based products when on a holiday vacation in a country that sells them legally. Write letters to NOAA, Congress, your senators, or even the president. Stay 50 yards from any marine mammal, bird, or sea turtle when swimming in the ocean. On behalf of all the animals at Clearwater Marine Aquarium (including Nicholas), I hope that these tips will encourage you to do your part to protect the oceans for generations to come. Panama , just like Winter, loves that blue "bed" that Winter likes to rest in when she is not doing demonstrations. 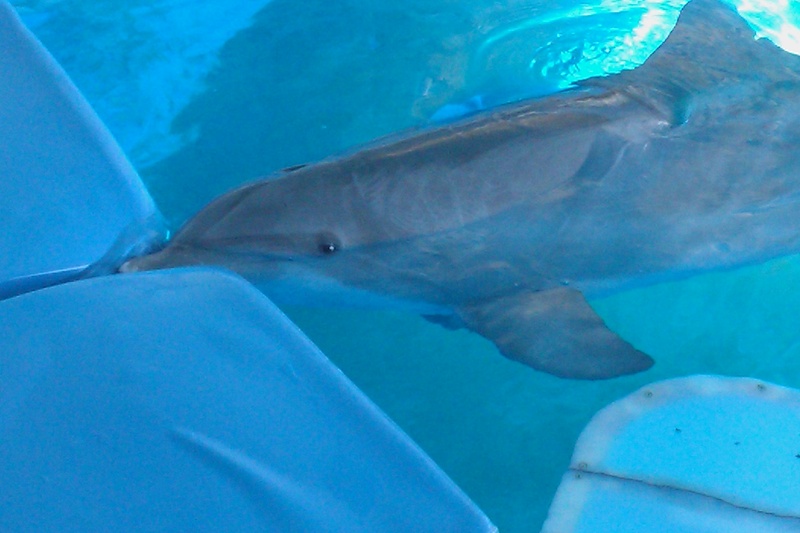 Panama is the oldest dolphin resident at Clearwater Marine Aquarium. She is estimated to be in her late thirties to early forties. She was sent to Clearwater Marine Aquarium from Gulf World Marine Park in Panama City, FL in 2000. When she was rescued, she received rehabilitative care for anemia, sunburns, and infection. Although she would respond well to treatment, she did have worn down teeth and suffered from a very low stranding weight at the time of her stranding. She was also associated with” beggar” dolphins that would wait for people to feed them from their boats. And because of all this, Panama was declared “non-relesable” by both NOAA fisheries and the US National Marine Service. 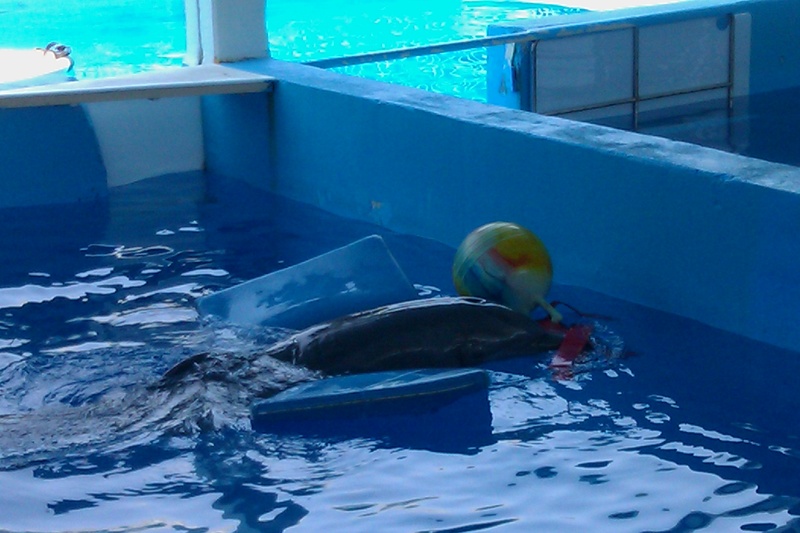 In 2007, it was discovered that Panama had become deaf after the trainers were seeing her no longer responding to whistle blows during sessions. 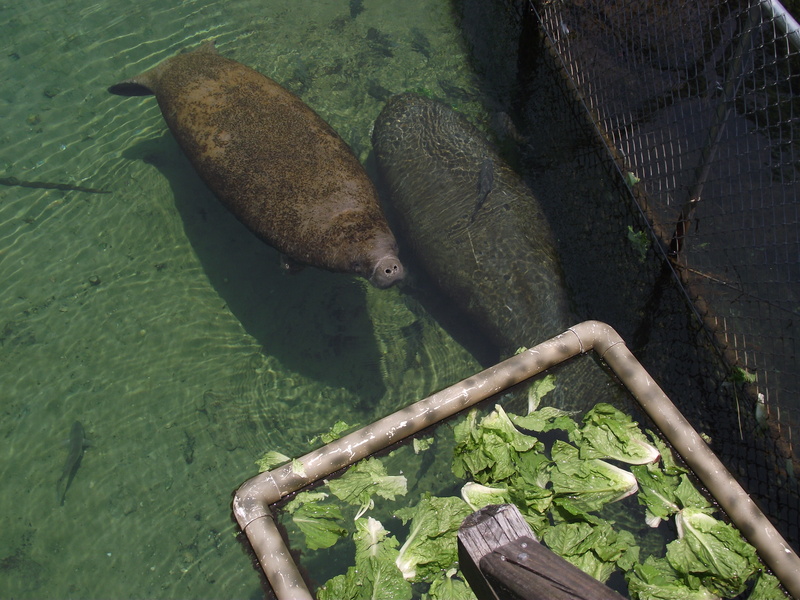 Currently, Panama weights around 450 pounds and is Winter’s adopted mother. In these days, Panama is a laid-back old lady who likes to check people out during the day and play with her toys at the Winter Zone. 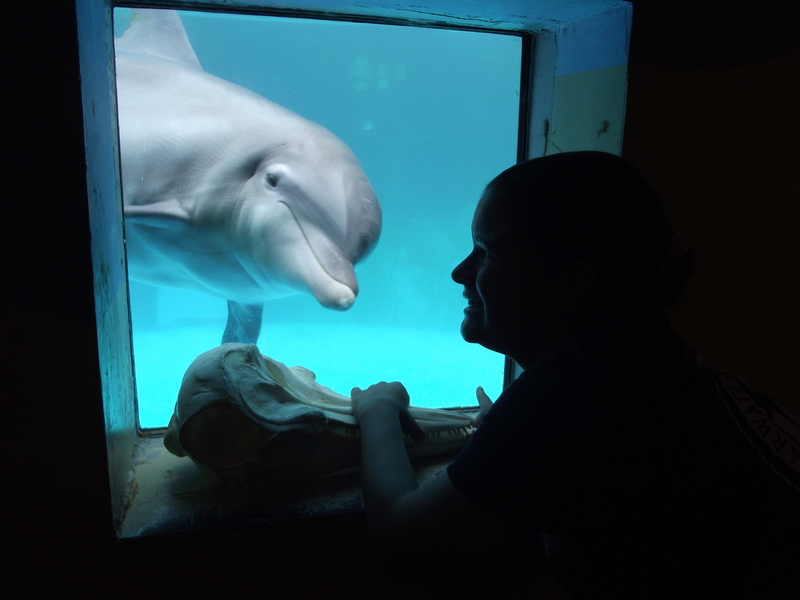 She is mainly used for guests interaction programs and does most of the physical acts in dolphin presentations. The Sea Carven has three different touch tanks. 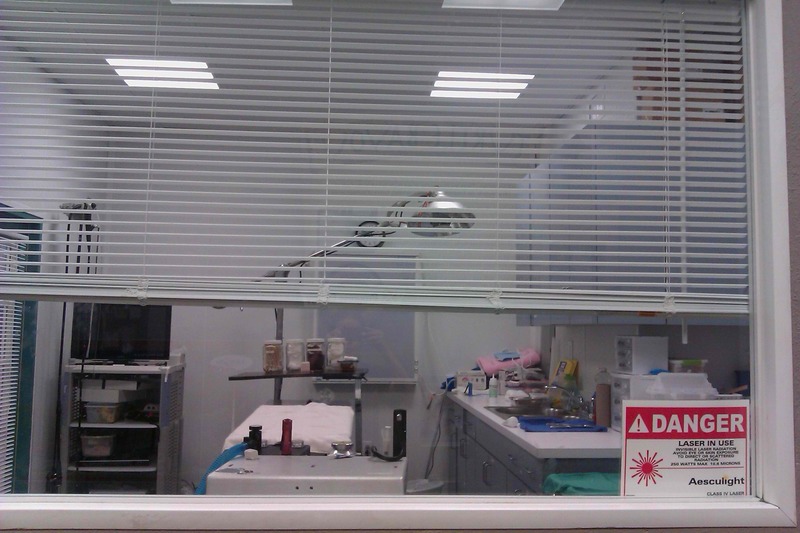 The first tank to the left is for animals that are in quarantine. 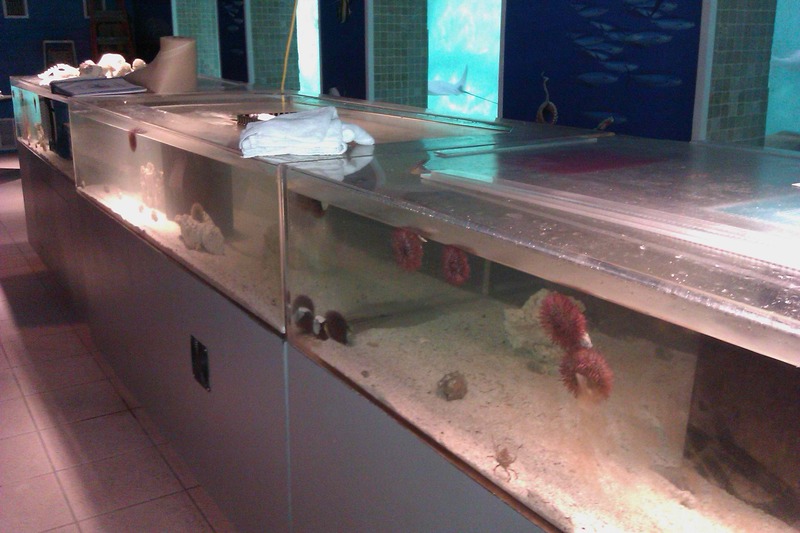 The second, which is in the middle is the only tank we allow guests to touch the critters under supervision. The third is for animals about to be released. So today, I worked at the touch tank which is located in the Sea Cavern exhibit. It was nice and quite with just only a few families just coming by so that they could allow their children to get a chance at touching one of our little critters. However, just a few minutes later, the cavern was loaded with families and youth groups, all of whom, all want to let their children have a chance at touching a little critter. There were so many kids at the cavern that I just wanted to tell you the story about one of them. So, this young girl, who was with her mom came up to me before I asked her from the other side of the touch tank if she would like to touch a critter today. 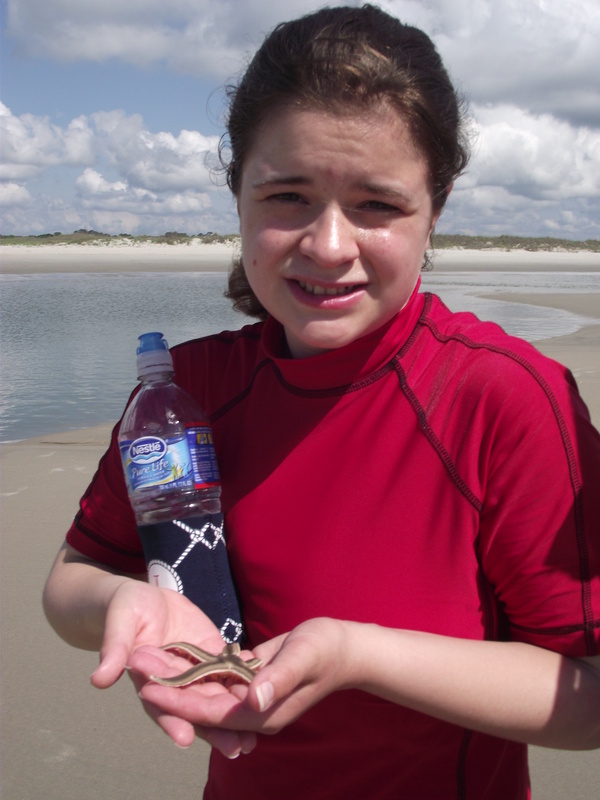 The girl replied, “yes” and before long, I shared with her a variety of little critters, including several sea urchins. After touching her first critter, this girl would keep on coming right back to my tank side and ask me if she could hold another animal as I continued to show off hermit crabs and a fighting chonch to other people in the cavern. Eventually, I respected her wish and I picked up an animal for her to hold and I would tell her all about it. Yes, even this large hermit crab was made to put up with the large crowds at the Sea Cavern today. One of the reasons why I tell people about some of the animals that they get to touch at our touch tank is because people like to be informed about the animals they are seeing. 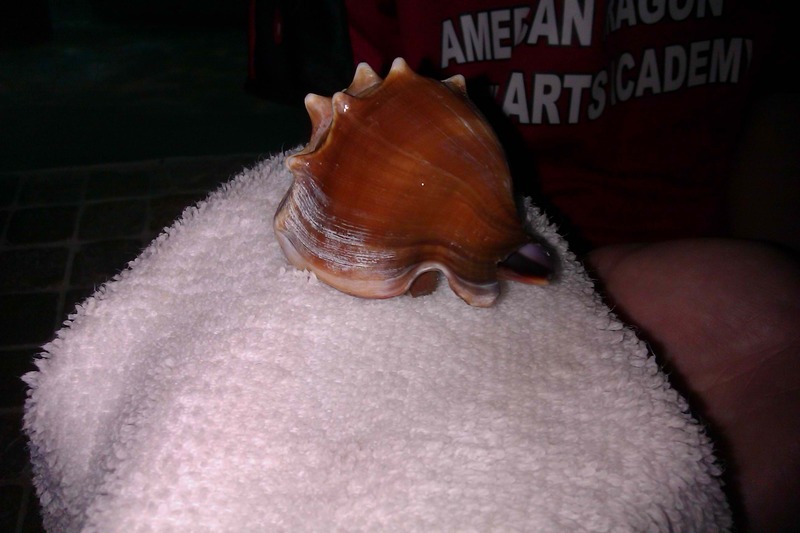 For example, while I allowed some boy to hold hermit crab, I would tell him and his family the fact that hermit crabs are crustaceans that are born with their shells but they move from one shell to another as they get older, and so on. On some occasions, some of the guests would tell me stories about a time when they encounter such animals elsewhere. It’s pretty Amazing how connecting with people with just sharing a few little critters.